Pumpkin cookie dough, anyone? Rich in coconut flavor and punctuated with pecans, eating a few of these bites offers the satisfaction of a sweet treat without sugar shock. I started with an old recipe of mine, Chocolate Topped Acorn Bites, and came up with an even healthier paleo pumpkin snack. These are naturally sweetened by dates and are rich in fiber and healthy oils thanks to the coconut. Tasting one or two of these pumpkin bites has convinced that clean eating can be delicious. It is amazing how much better I felt right after eating one. Instead of “whoa, that’s a lot of sugar!”, I was nourished and my sweet-tooth satisfied. 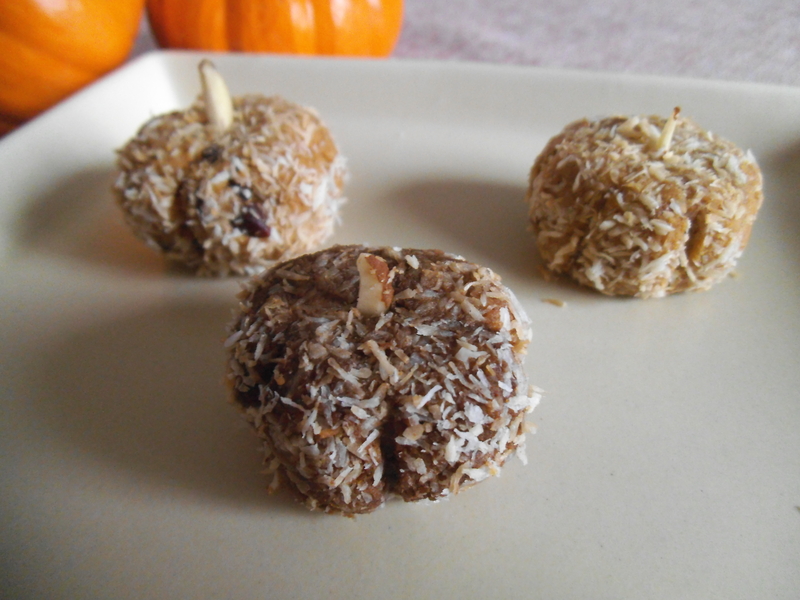 Coconut pumpkin bites can get a little more decadent with chocolate, but they also are delightful with dried fruit. The recipe includes two flavour directions that you can choose. I like to divide the dough and make both a chocolate and non-chocolate version. The pecan bits make an important contribution to both the flavour and texture of these, so be sure to include nuts (or seeds) if you possibly can. Shaping each bite into an adorable pumpkin is optional, but adds to the fun. Since no baking is required, there might be time to embellish them a bit. Or you can skip that step and roll the dough into simple balls if you are in a hurry. Enjoy! In a small saucepan, soak dates in 1/2 cup hot water until softened. Add 1/2 cup coconut, pumpkin, and ground cinnamon. Heat over medium-low, stirring frequently so that the dates do not burn. Simmer and stir for about 5 minutes. Turn off heat. Gradually stir in coconut flour with a fork until a dough forms. If desired, divide the dough in half and transfer each portion to a separate bowl. For a fruit-nut version, stir in cranberries and half of chopped pecans. For a chocolate version, allow dough to cool to room temperature and add cocoa and honey. Stir until evenly incorporated into the dough. Fold in chocolate chips. Divide dough into balls and coat with toasted shredded coconut. If desired, shape balls into pumpkins, scoring the sides with the dull edge of a knife blade. Place an almond sliver in the top for a stem. Cover and refrigerate until ready to serve. I’m sharing this recipe at Saturday Dishes. Looks and sounds declicious, pinned to my Sat. Dishes board. This will be good to make soon and will be delicious I am sure. Thanks much. I hope you like them. I’ve got a little stash in the freezer now for when I need an energy boost.